HUMOR: YOU THOUGHT I MADE THIS STUFF UP? MAD, you say?? You call me MAD? Check out THESE CONTRAPTIONS and see those who dared to create the real McCoy! For those that are into 'might have been/SHOULD have been' history in a whimsical vein, the Victorian Era presents just the right amount of humor interlaced with just enough historical potential to make a great era to game in. There's something about the juxtaposition between the very, very serious Britisher riding a giant clunky FICTIONAL conveyance, all rivets and steam, that makes for very humorous games. This strange intersection between Colonial Era and Science Fiction Gaming is called VICTORIAN SCIENCE FICTION (or VSF). You may have heard other terms associated with it, such as STEAMPUNK GAMING, etc. VSF takes as its antecedents such works of fiction as H.G. Wells' THE WAR IN THE AIR and WAR OF THE WORLDS; Jules Vernes' 20000 LEAGUES UNDER THE SEA and AROUND THE WORLD IN 80 DAYS; John Buchan's THE 39 STEPS and GREENMANTLE; and anything by Arthur Machen, Lovecraft (to some extent), H. Rider Haggard, or any other Victorian-to-Edwardian author who touched on the fantastic or macabre. Victoriana , for want of a more definitive term, represents a "magical reality" world view; a time of great potential and peril, a juxtaposition of the cosmic and the mundane, and an intersection between magic and "normal" universes. Surprisingly, I find there is a LOT of material out there on what I considered a small niche of science fiction; this series of pages will attempt, as best I can manage to coalesce some of the threads blowing around out there. What will be covered? Well, anything that merges on the fanciful, set roughly in our time period. Foundry's Darkest Africa, for instance, contains many interesting and fantastic elements, so it will be included. A Battle Report about Ombdurman will not. The Wild West (straight-up) is not really Victoriana, but the Great Rail Wars (and, ahem! Scary Monsters of the Golden West) is. 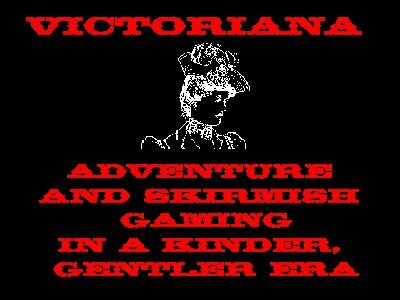 For one of the best, well-researched and thorough investigations into the subject matter of VSF, take a minute to browse FANTASTIC VICTORIANA. Come back after the requisite hour or so has passed-- because a minute won't be enough, I guarantee it! VSF seems to have had something of a Renaissance of late; with many major manufacturers (Eureka, Foundry, Reverisco, and Scheltrum) having made miniature figures for the genre. The first dedicated rulebook of skirmish rules for VSF, GASLIGHT, was published in early 2001 to general popularity-- and the long out of print SPACE: 1889 game (GDW) has been reprinted by the publishers of the Heliograph. Matt Fritz shows us how to SCULPT TERRAIN with a Wonder Cutter. Le Grand Cirque (LGC) is (ahem ) my own little venture into VSF gaming. LGC postulates that the Great Powers have resolved to fix their differences on the field of sport rather than with bloody warfare; thus, the International Grand Circuit Race was born. Under the leadership of Colonel Hiram Oliphaunt, Ret. (KoB, OTBE), the Grand Circuit Race proved to be a smashing success. The Grand Circuit (which has morphed into the punning "Le Grand Cirque", much to the annoyance of racing officials) has been run in Texas, Indiana, and soon, the Pyramids in Egypt. Check out the Museum of Retro Technology. Some of the contraptions in there have a distinct "Cirque Flavor". Help choose or design a Le Grand Cirque T-Shirt Logo! Either Email me your preferences or leave them up in the Guest Book. Thanks. Check out my campaign setting for GASLIGHT, "THE BARON OF THE OZARKS"
The first "big-money" foray into VSF was from the fertile mind of Mr. Frank Chadwick, late of GDW games. 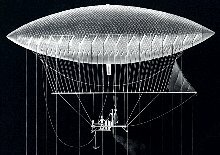 The SPACE: 1889 universe presumed that Thomas Edison discovered a means of lighter than air flight decades before the real thing happened; and furthermore, he discovered a means to travel between the "aether" that exists between planets. His expedition to Mars results in an amazing discovery; Mars is populated with an ancient, sophisticated culture, a culture which may not possess the technical sophistry of the Earthlings, yet still can manage lighter than air flight with "ether flyers". The game system itself was first published as an RPG; it spawned several gamebooks, two boardgames and an excellent miniature gaming supplement, THE SOLDIERS' COMPANION. Sadly, GDW has gone the way of the California Condor, but a new company has sprung up to publish the Space 1889 line-- The Heliograph. 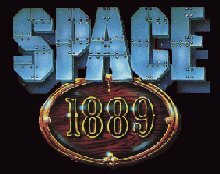 (More Links and Resources for SPACE 1889 are presented below). Marcus Rowland's labor of love, FORGOTTEN FUTURES, has been in print and available on the web next to forever. Now, FF is a commercial product available from the Heliograph people. Whereas it IS my goal to explore miniatures-style games on this website, FF still is an excellent rules system for a diverting evening's entertainment (for smaller groups). As a source of inspiration for a skirmish gamer looking for a nice setting, FF is unparalleled. R. Talsorian Games' Victorian era RPG, CASTLE FALKENSTEIN, may be considered something of a lightweight by the technophiles out there but Talsorian has produced a lengthy list of excellent gaming supplements set in the same "alternative Victorian era." From Prussia with Love is particularly good. Here is a list of the Falkenstein Webring sites; some of these pages have some excellent source ideas for various aspects of Victoriana including magick, conveyance design, spiritualism and even fan fiction. Worth a perusal. Wessex Games is the publisher of AERONEF, a game of combat between lighter-than-air craft that are reminiscent of SPACE: 1889's "Cloudships". Wessex also publishes VOYAGES EXTRORDINAIRES, a 28mm Victorian Adventure style game. Landcruiser:1889 (soon to be retitled to THE IRON FRONTIER) is a work in progress from a nift-o wargaming club located in Fredericksburg, VA. The focus of these rules are landship to landship combat, and are fairly simple, funny and surprisingly comprehensive considering their brevity. See the Panzerschiffe Discussion board link (Yahoo Groups) in the Discussion Group Resources section, below. 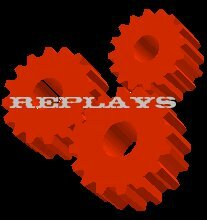 See, also, the Nelson's Bluff Replay in the Replay Section, directly below. The Great Rail Wars (links below) by Pinnacle Entertainment, is definitely in period, although it does take place in a much transformed version of the American West (for the most part). GRW is a miniatures battle game that is sold as a starter set with many, many add-on packs of miniatures that are suitable for either the battle game or the associated RPG, DEADLANDS. A very unusual and intriguing environment for VSF. Westwind Productions, a British Company (links below in RESOURCES), has come up with a skirmish rules set called GOTHIC HORROR. I have not played this one yet, nor do I own the rules, so I'm somewhat in the dark about them. However, I have enthusiastically purchased their miniatures line, which is replete with several kinds of vampire, werewolf, mummies, killers, maniacs, polizei, vampire hunters, evil cossacks, and gypsies. There's enough material in this miniatures line to keep a guy like me busy for about five years!!!! HIGHLY RECOMMENDED. NEW! Unsolicited Mystey Cirque Pictures arrive in my mailbox! Check out THE DARK SWEATY HEART OF THE CIRQUE page. G.A.S.L.I.G.H.T. "Raid on Key West"-- First Battle in the Texas-Prussian War! Ordering Forgotten Futures from Heliograph, Inc. The Miniatures Page (Web Periodical on Miniatures Wargaming in general. THE most useful site in the hobby).